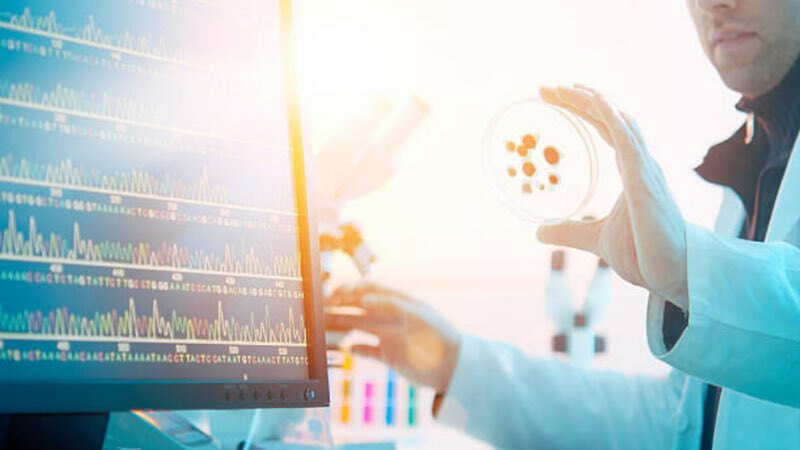 The number of active biotechnology businesses in the UK working in the field of research and experimental development has soared by 65% in just over three years, a new analysis by investment manager Downing has revealed. The sector has been attracting record levels of funding; annual investment reached £2.2 billion (US$2.9bn) in 2018. Analysis of official data from the Companies House register indicates that 3,456 active companies are currently involved in biotechnology research and development (R&D) activities. This represents a 65% increase from Q1 2016 when 2,095 active companies were classed as engaging in biotech R&D. Downing’s analysis suggests almost two fifths (44%) of active biotechnology businesses have been incorporated in the three years since January 2016. This includes 127 in the first two months of 2019; equivalent to three every working day during January and February. The findings follow record investment in the UK biotech sector during 2018, with figures from the UK BioIndustry Association (BIA) and Informa Pharma Intelligence revealing the sector raised an unprecedented £2.2bn from investors in 2018: up 85% from 2017. Venture capital has contributed 51% of UK biotech funding from 2016-2018, increasing by 63% from £681m in 2016 to £1.1bn in 2018. While investment to date has largely come from institutional venture and private equity funds, innovative providers are beginning to create products designed for a retail audience. While private limited companies make up the majority of active businesses in the sector —96% in Q1 2019, up from 95% in Q1 2016— Downing’s analysis also shows the number of public limited companies (PLCs) has increased by 40% from 30 to 42 as biotech firms experience continued growth and success. The BIA figures indicate that IPOs contributed 15% of funds raised by UK biotech companies from 2016-2017, increasing to 20% in 2018. Downing’s research highlights that London, Oxford and Cambridge have strengthened their position as the UK’s ‘Golden Triangle’ of biotech in just over three years, now accounting for over a third (34%) of UK biotech companies. This compares to 27% at the start of 2016. Leading this trio, London has reinforced its status as the home of UK biotechnology and now plays host to nearly one in four (24%) registered businesses, compared to fewer than one in five (18%) in Q1 2016. The number of biotech R&D businesses based in the capital has increased by 120% over the last three years. Cambridge ranks second with 7.5% of biotech businesses located here in Q1 2019, followed by Oxford with 2.3%; surpassing Manchester and Nottingham since Q1 2016 to place third in the regional rankings. Oxford’s biotech business population has increased by 95% in just over three years. 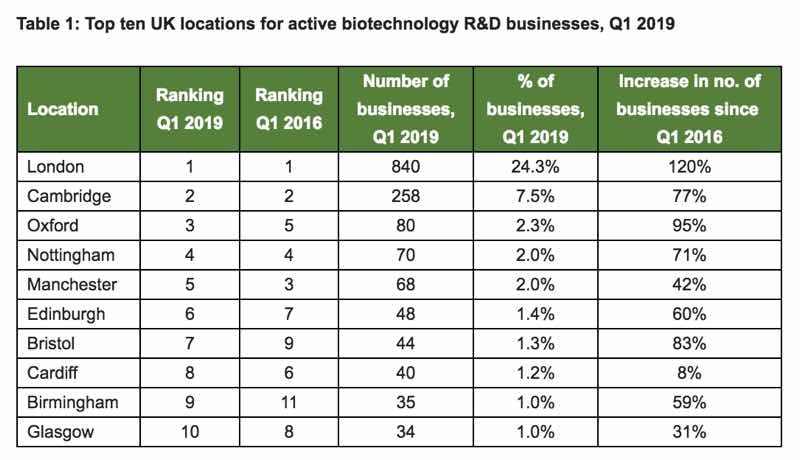 Outside of the Golden Triangle, Nottingham and Manchester continue to make up the top five UK locations for biotech R&D activities, each accounting for 2% of active businesses in Q1 2019. Comparing business population growth since January 2016, within the top ten UK locations for biotech R&D, Nottingham (71%) and Bristol (83%) have both outperformed the industry trend (65%) as the sector has rapidly expanded through new investment and innovation. 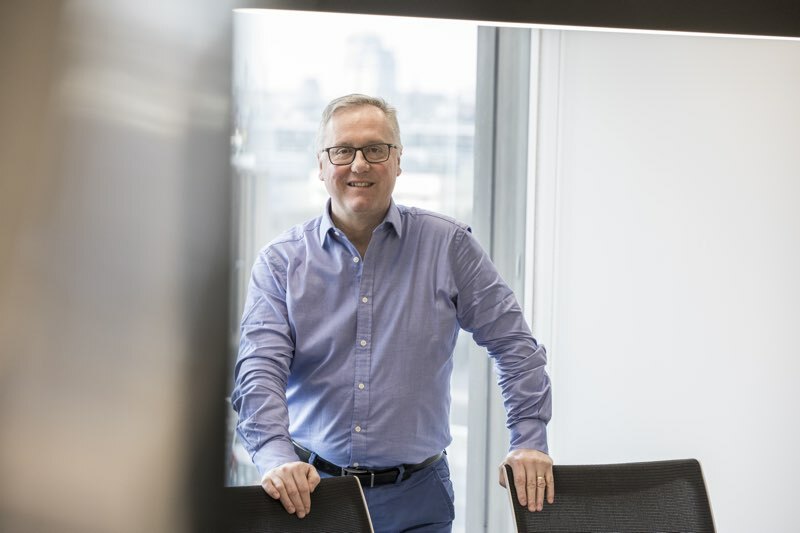 Jeremy Curnock Cook, Managing Director, BioScience Managers, said: “Healthcare investing is all about timing —using deep expertise to identify promising companies that can deliver within the desired investment window. “While some industries are voicing concerns about the post-Brexit outlook, we’re excited by the opportunity for the UK to become a truly international hub for the healthcare sector with an attractive funding environment for companies from all over the world," he concluded.